The GST roll-out on 1st July 2017 has paved the way for realization of the goal of One Nation- One Tax - One Market. GST is expected to benefit Indian economy overall with most tax compliant businesses getting favourably impacted. It should in time reduce the cost of goods & services, giving a boost to the export of products and services. It would also foster ‘Make in India’ initiative. GST promotes the concept of common market with common tax rates & procedures and removal of economic barriers thus improving ease of doing business. We stand by the Government with our role as “Partner in GST Knowledge Dissemination” and have always been supporting Government with our intellectual resources, expertise and efforts to make the GST error-free and a successful venture across in India. To make the knowledge dissemination process smoother. We have updated the 4 editions of “Background Material on GST Acts and Rules”. This Background Material is comprehensive containing clause by clause analysis of the GST Acts, rules, recent notifications, circulars or orders issued by the Government from time to time along with FAQ’s, MCQ’s, Flowcharts, Diagrams and Illustrations etc. to make the reading and understanding easier. This Book contains a clause by clause analysis of the four GST acts viz Central Goods & Service Tax Act, Union Territory Goods & Service Tax Act, Integrated Goods & Service Tax Act and the GST (Compensation to States) Act, 2017. 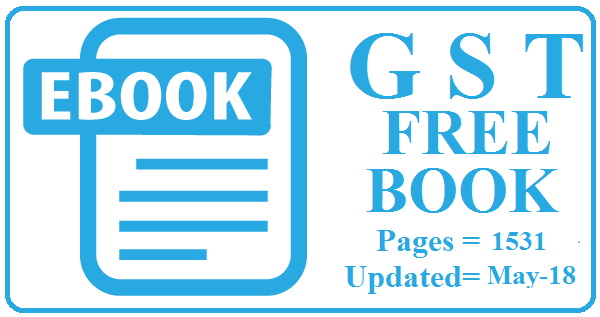 To Download Free E Book on GST,Please share this Link on Facebook or Twitter or Google Plus and click the Link from your Facebook,Twitter or Google Plus page. To save right click on the Link given below & click "save link as" or "save target as"
Not able to open Lock/download the Book ,Please Visit Page-2 or Send us an email at raniraj1950 at gmail.com with subject "Free E Book on GST-Updated May-18"
I tried to download the GST Ebook after sharing and liking it on my facebook ,but was unable to do the same. I am also interested your E GST Book. My id is "binu@draccounting.in"
Kindly forward to my mail id gsbraj1@gmail.com as i m not unable to download the same. tried to download the GST Ebook after sharing and liking it on my facebook ,but was unable to do the same. send it to my mail. Please st me the books on ajayonline80@gmail.com.